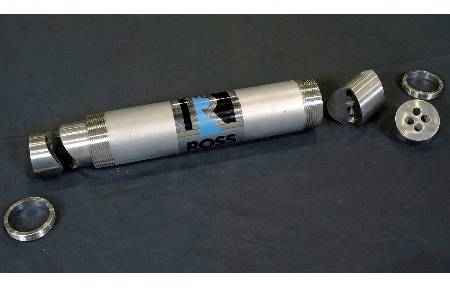 The Ross Interfacial Surface Generator (ISG) is a patented Static Mixer (US Patent No. 3404869) designed for laminar flow processes such as blending a minor component into a viscous stream. Despite having very different viscosities or densities, fluids entering an ISG Static Mixer are repeatedly combined and subdivided into layers until a homogenous mixture is achieved. Starting with two input streams entering the mixer, over two million layers emerge after just 10 elements. Each ISG element consists of four passageways set at oblique angles. Material near the periphery (i.e. near the pipe wall) on the inlet side of the element emerges near the center on the outlet side. This radial mixing eliminates the wall smearing effect encountered in other static mixer devices. The ISG Static Mixer can be supplied as a complete plug-in module or as individual elements for installation into an existing pipe or tubing. Fabricated in stainless steel, polypropylene and Teflon, ISG elements are available in a range of sizes from 5/8” to 24" diameter. The pieces simply stack together and seal automatically; retainers on each end of the mixer housing secure the elements in place. The steel housing can be fitted with flanged, threaded, or tri-clamp connections, heating/cooling jacket, injection port and other custom features. During product changeover, the ISG elements are easily removed from the housing and cleaned individually.